Recently released 2013 Social Security and Medicare trustees reports prompt a reexamination of the current and projected financial status of the trust funds. This chart series includes updated versions of previous Mercatus Center charts presenting the costs, balances, and prospective program insolvency dates for Medicare and Social Security programs. The first two charts show the trust funds’ annual cash flows and future deficit spending patterns. The third chart compares the projected years of insolvency from previous reports. 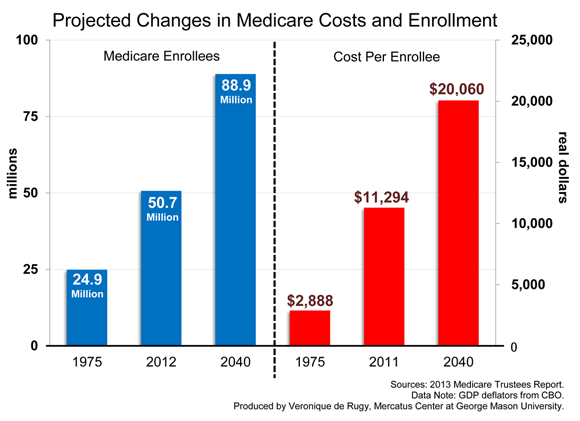 The last chart shows Medicare costs per enrollee and the number of enrollees for particular years. 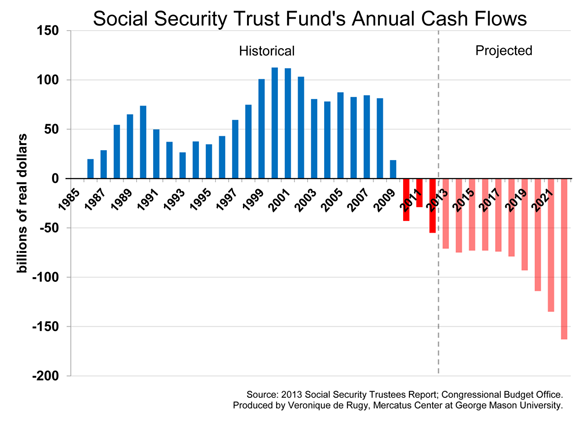 Since 2010, the Social Security program has been running a permanent cash-flow deficit. This means that the taxes collected for the program aren’t enough to cover the benefits paid out to retirees. To fill the gap, the program draws from the Social Security trust fund (first using the interest, then the principal) to sustain payments to retirees. When this option is inadequate, the US Treasury will have to borrow to pay back the trust funds. 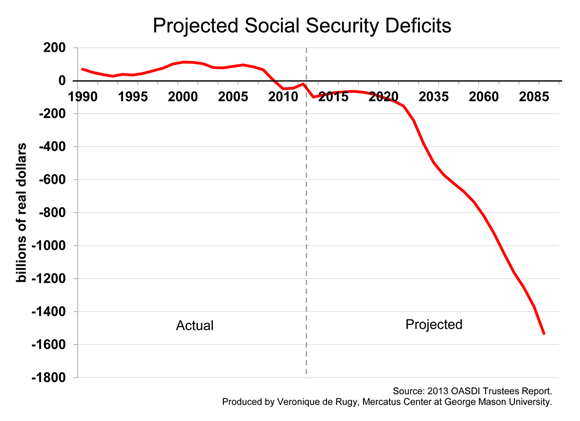 As Chart 2 demonstrates, under current law assumptions the Social Security program will continue to run large deficits indefinitely. The dwindling trust fund determines the spending authority of the program. Without a positive balance in the trust fund, the program won’t have the authority to pay out full benefits and will be limited to what the program collects in taxes — which today means a 23 percent cut in benefits across the board. 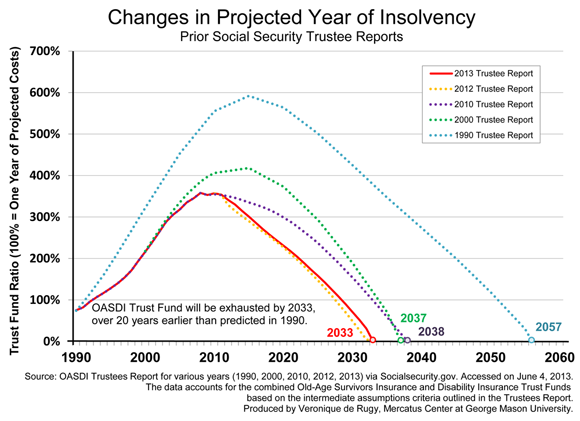 There was no change in the combined (retirement and disability) exhaustion dates for the Social Security trust funds when compared to the 2012 Trustees Report. The combined trust fund is projected to exhaust its reserves in 2033, but this projected year of insolvency is 20 years sooner than the date projected in 1990. Based on the 2013 Trustees Report, by 2040 Medicare will cover about 89 million people, and the cost per beneficiary will be almost double current levels. The maintenance of Medicare finances requires significant changes, especially with the expected surge in Medicare enrollees over the next 30 years. If current trends persist, Medicare will consume a larger share of the federal budget and ensure a future of higher taxes for workers and smaller or nonexistent benefits for retirees. The bottom line is that we will have to either find sources to pay for even more than projected payroll tax and premium revenues to keep pace with promised benefits or fundamentally reform the programs.